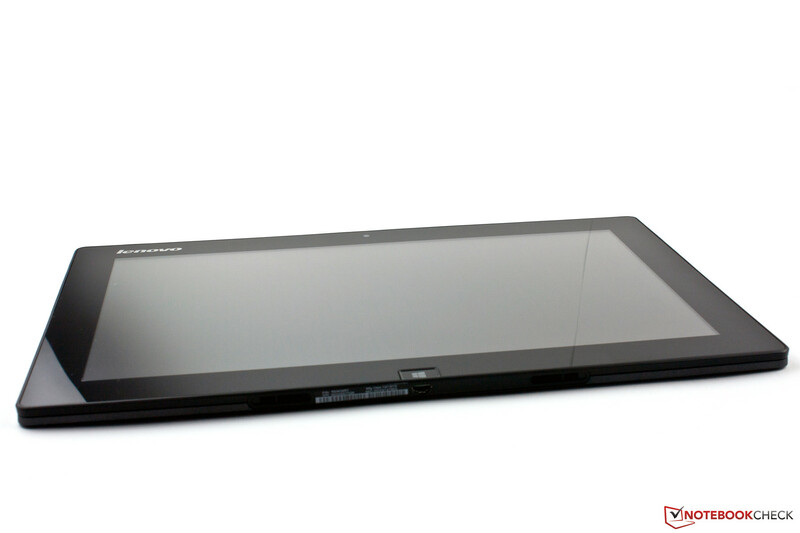 We have previously tested the IdeaTab Lynx K3011W tablet in April. 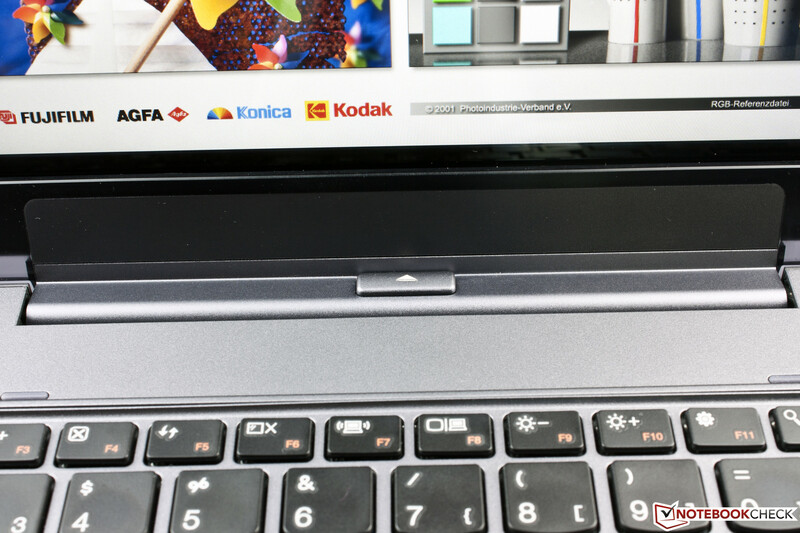 However, as the keyboard dock K30PK11 was not available at that time, we have decided to take a second look at what this test model has to offer. The dock turns the tablet into a netbook and adds two USB 2.0 ports and an extra battery. Otherwise, the test model is identical to the one we tested in April. 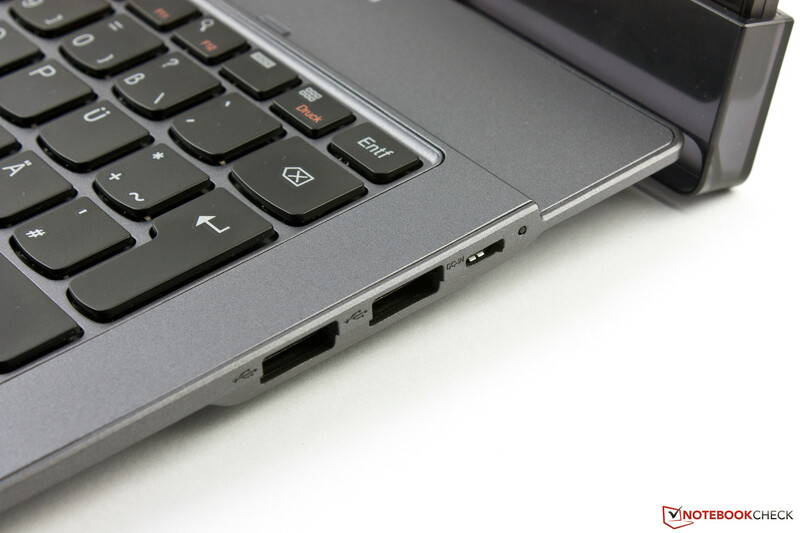 The focus of this review will be on the performance with the docking keyboard. 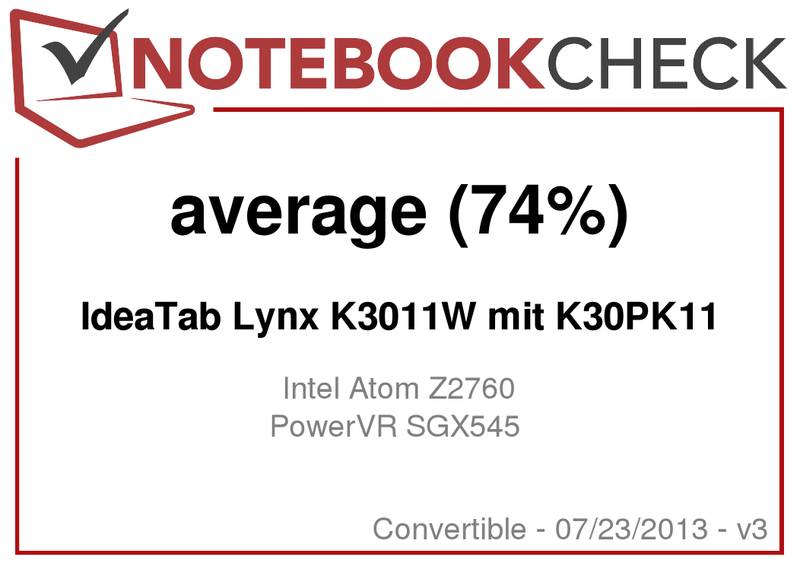 This dock allows us to classify the K3011W as a convertible, which means that we can use competitors of this category, like the HP Envy x2 11-g000eg, the Samsung Ativ Smart PC XE500T1C as well as the Acer Iconia W510, for comparison. 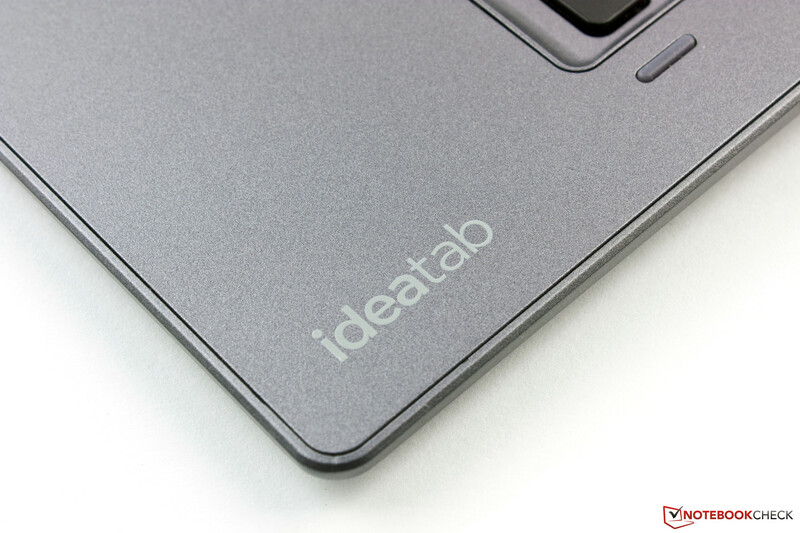 In the following in-depth review, we will take a look at how the keyboard dock changes the Lenovo IdeaTab Lynx and how well it performs against the competition. A lot of synthetic material: the IdeaTab Lynx K3011W. Large gap in the keyboard. The power LED shines through a gap. The tablet is made entirely of fiberglass and synthetic material. The rear of the tablet is gray and offers a nice grip. The test model looks good but feels cheap. 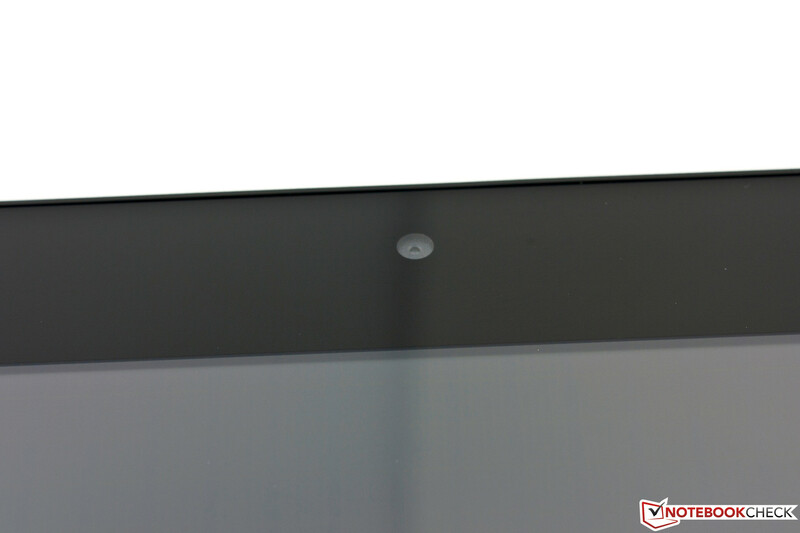 The choice of average materials and relatively sharp corners do not improve the image of the tablet. Thankfully, nothing creaks and the sturdiness is decent. 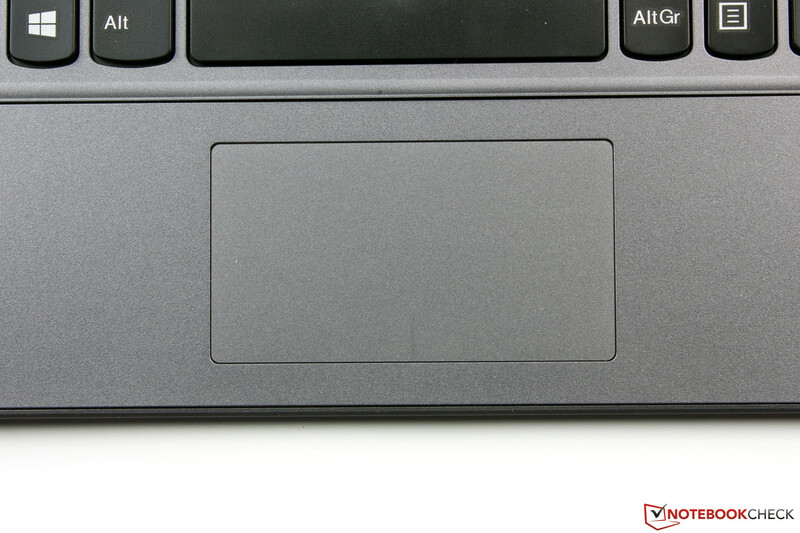 The keyboard dock is comprised entirely of gray synthetic material and is completely smooth. 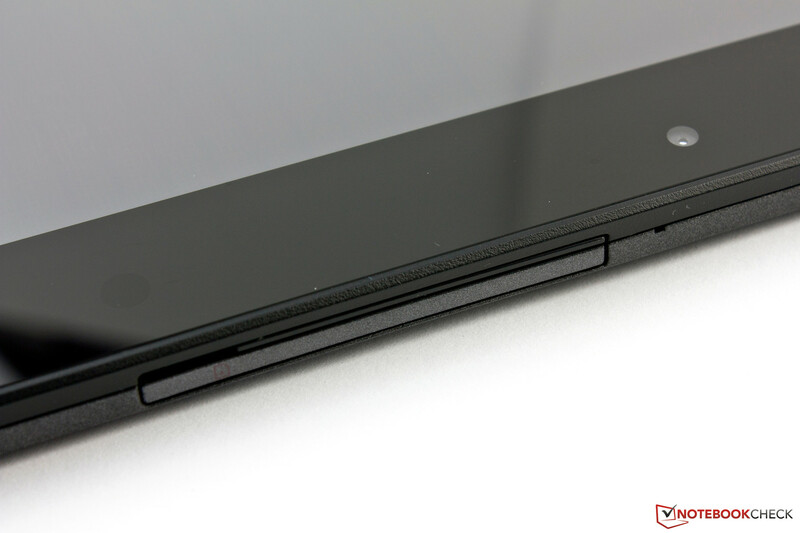 In comparison to the tablet, the gaps between the materials of the dock are uneven. There is a partial gap of half a millimeter between the border and the base of the dock. This allows the status LED of the power outlet to clearly shine through. The other components are securely fitted, but the keyboard dock does not inspire confidence with its uneven workmanship. The sturdiness of the dock leaves room for improvement. Even slight force can bend the material inwards significantly, but thankfully, the material does not creak. An important part of a convertible is its hinges, as these connect the two parts together. The hinges of our test model are made of metal and they seem to be quite sturdy. A chunky border made of a combination of translucent and opaque material offers good protection but is a bit wobbly. Once connected, the two devices are securely anchored to each other. Although the tablet can be moved around a little, it does not feel like it would fall out. 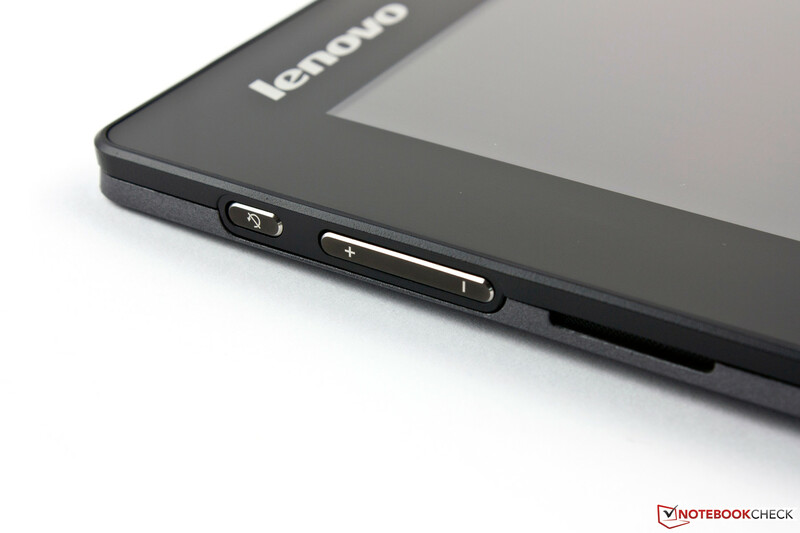 The IdeaTab Lynx has no docking interface, and has to use the Micro USB port for the docking port. The tablet measures 300.9 x 188 x 9.48 mm (~11.8 x 7.4 x 0.4 inches) and with the dock it grows to 305 x 204 x 26 mm (~12.0 x 8.0 x 1.0 inches). The weight amounts to 1,295 grams (~2.85 pounds) (Tablet: 632 g, Dock: 663 g/~1.39 and 1.46 pounds respectively). This means the Lynx is the largest model of our comparison group. The Samsung XE500T1C (304 x 189.4 x 20.5 mm/~12.0 x 7.5 x 0.8 inches; 1,455 g/~3.21) and the HP Envy x2 (303 x 206 x 19 mm/~11.9 x 8.1 x 0.7 inches; 1,410 g/~3.11 pounds) have similar dimensions. 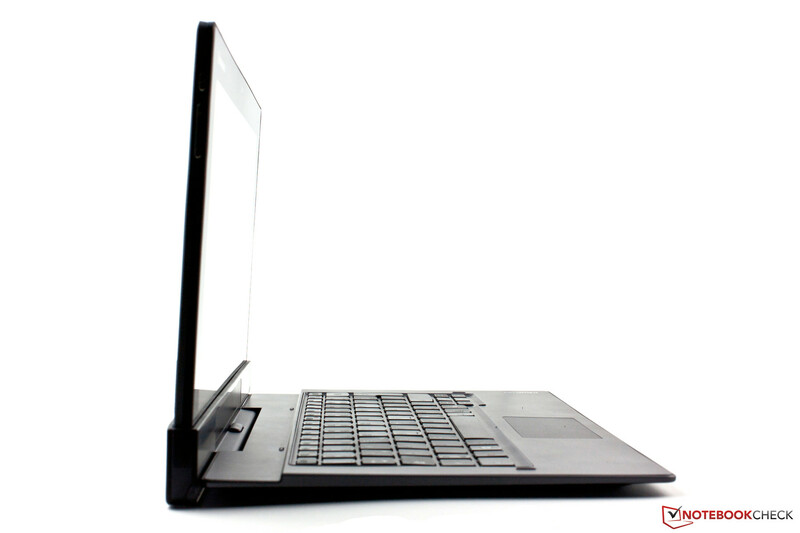 However, only the Acer W510 (187 x 259 x 9.9 mm/~7.4 x 10.2 x 0.4 inches; 1,266 g/~2.79) can stand out of the group with its flat build. The batteries of our test model are securely installed (non-removable). Thanks to the Atom SoCs of the models, they can run without fans and are silent. The USB ports lie close to one another. The IdeaTab Lynx K3011W offers meager connectivity. The display interface is a Micro HDMI port, which works well. Connecting an external monitor or TV to this interface will result only in the screen content being duplicated over the two screens. 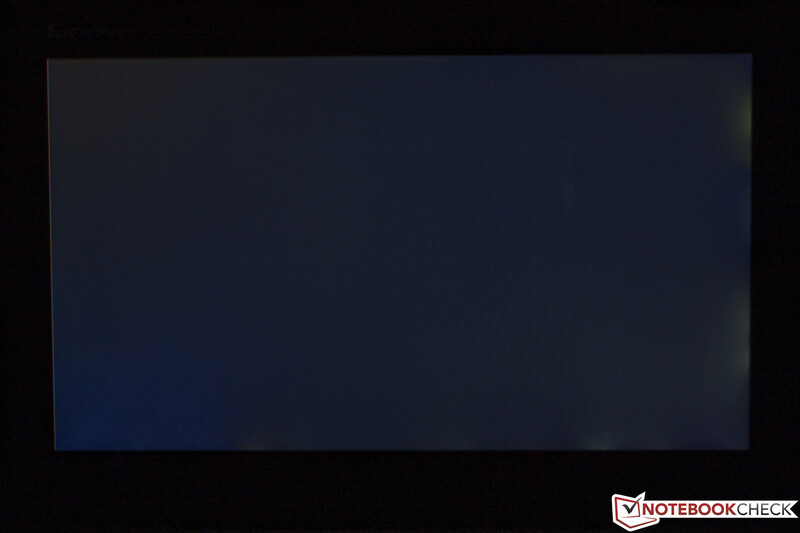 As this duplication utilizes the native resolution of the Lynx (1,366x768 pixels), Full HD monitors and TVs will have thick black borders around the picture. This issue can be dealt with by setting the external panel as the sole video output. However, at first, the picture will stretch too much and exceed the borders of the monitor (Overscan) and this can only be rectified using the monitor settings. We recommend this form of use only when the keyboard dock is attached, as the tablet screen will be black but will continue to react to touch input. Thankfully, the touchpad of the dock or an external mouse can precisely move the cursor and the multi-touch gestures are executed without delays. 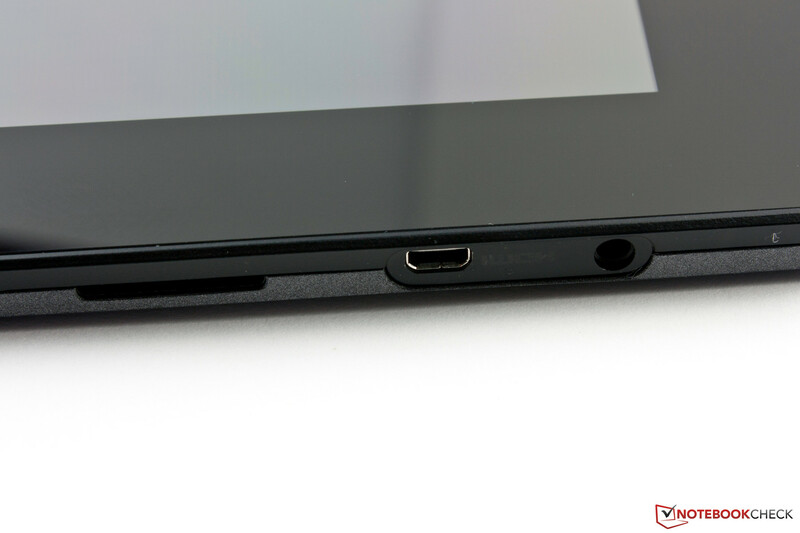 The tablet has a Micro-USB-2.0 port on the bottom, which is the interface used by the keyboard dock. 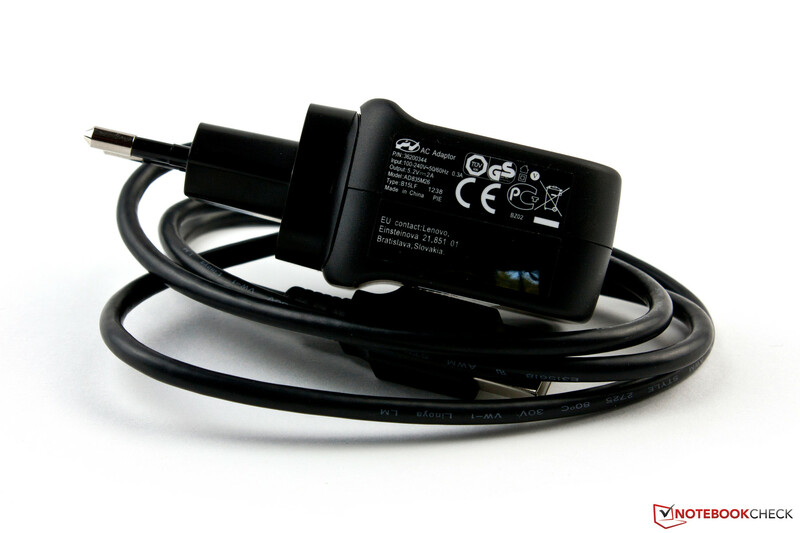 In tablet mode, the adapter included in the delivery can be used to connect traditional USB devices. The port offers enough power to run a 2.5-inch external HDD. In convertible mode, the Micro USB port is in use, but the keyboard dock offers two USB 2.0 interfaces on the right side. 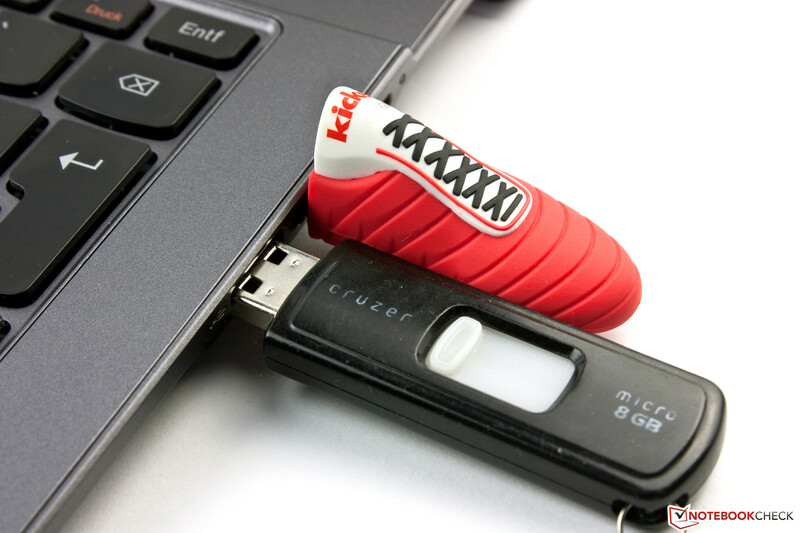 These are quite close together, which means that larger-than-average USB sticks can make it tough to use the neighboring port. 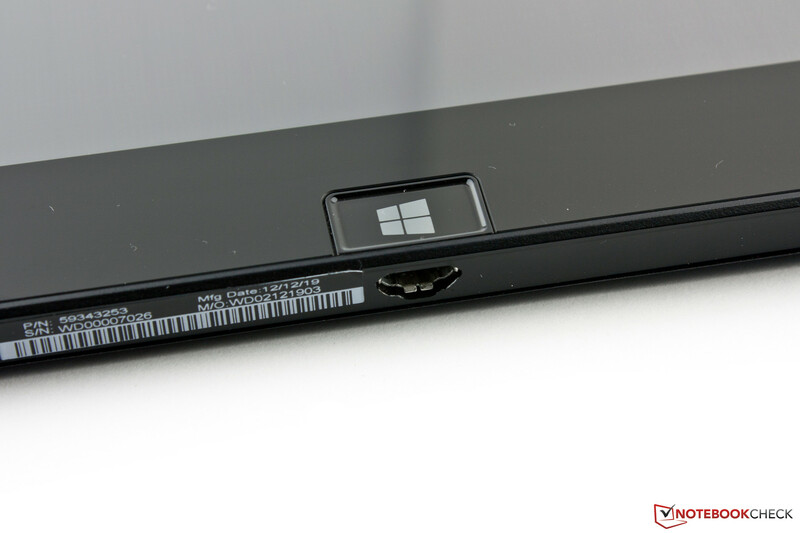 As the Micro USB port cannot perform as well as a docking interface, the USB ports on the keyboard dock can suffer from bottlenecks (lower performance as they have to share the same interface). The Micro USB port on the dock can only be used to charge the battery. The back has no ports. Left: volume rocker and rotation lock. Transfer of a 2 GB file close to a router. Wireless communication is provided by a Bluetooth 4.0 and a WLAN module from Broadcom. The latter supports IEEE-802.11 standards b/g/n and works on the 2.4 GHz frequency. Sadly, the module is not great: moving just a few meters away from the router can drop the transfer speeds to a modest level. 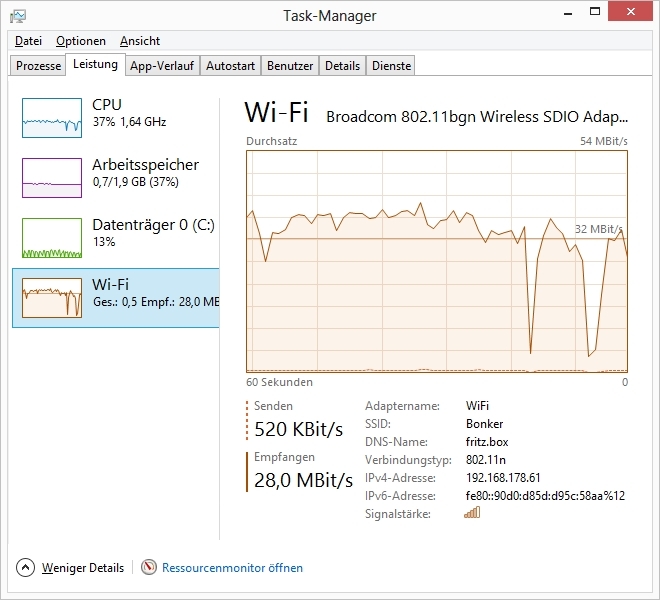 The maximum transfer speed measures 65 MBit/s, but we could not reach this level during our test. During our wireless transfers, we could only reach speeds in the range of 30 MBit/s. The WLAN module is a bit slow, as it required a little time to load a webpage or start a download if Wi-Fi had not been in use for a while. However, thereafter, the transfer ran quickly with ping times up to 51 ms (to the router) at full transfer speed. Although this is quite high, multiple pings can drop it to below 10 ms, which could be due to the "Power Saver" mode or the driver. A NFC chip (Near Field Communication) or WWAN module are not included in the IdeaTab Lynx. The accessories are few. The pure tablet version included a Micro-USB to USB 2.0 adapter in the delivery, but this was removed. The device includes a 10.4 W power adapter, a USB transfer cable, two manuals and a Micro-SD pick. 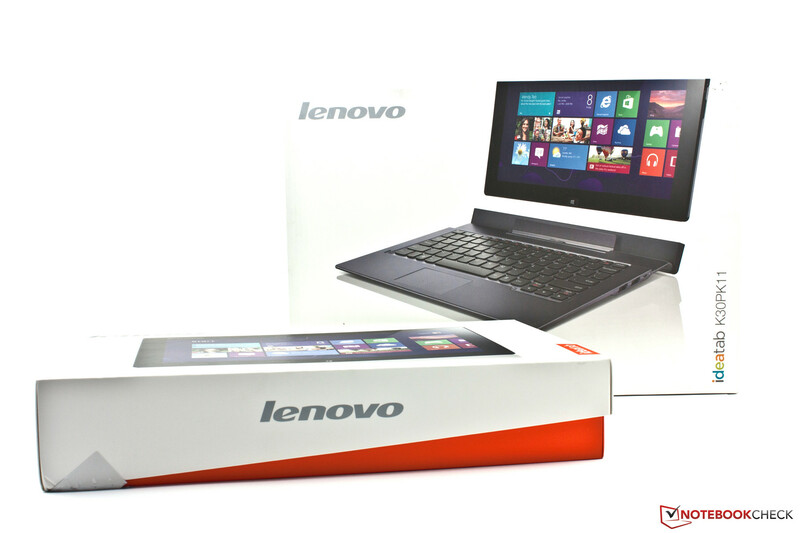 More accessories, like bags, stands and adapters are available in the Lenovo store. 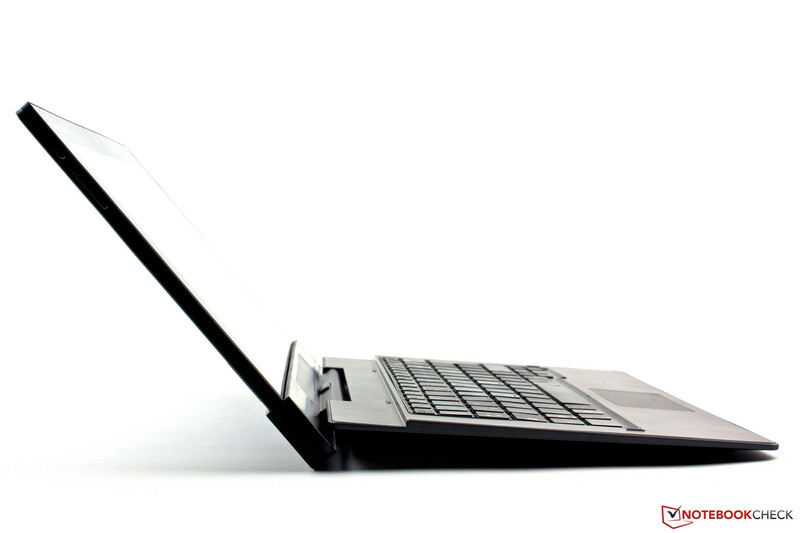 Due to the low power consumption of the Intel Atom SoC, the Lenovo IdeaTab Lynx can be completely passively cooled. This means that it does not require noisy fans. Maintenance flaps are not included. Neither the hardware nor the battery can be removed/replaced. Lenovo offers a 12-month warranty on its tablet. Buyers in Austria or Germany will receive a 24-month manufacturer’s warranty. The standard guarantee includes a Bring-In service. Extensive warranty packets (up to 3 years) with various insurance options can be found on the Lenovo homepage. 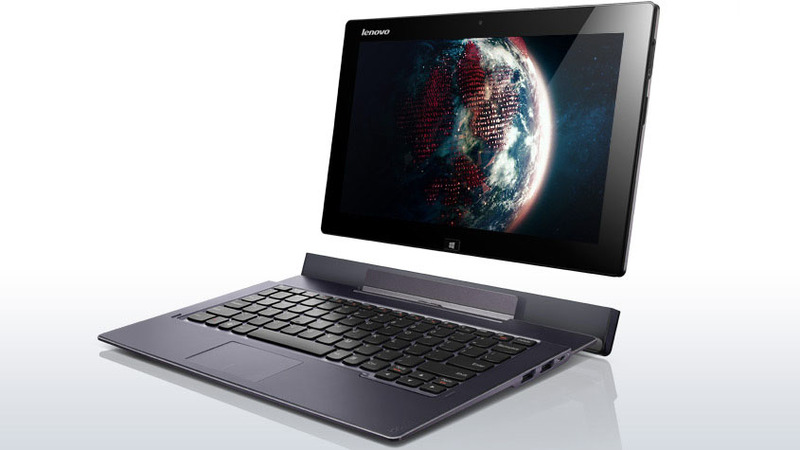 The Lenovo IdeaTab Lynx K3011W uses a capacitive touchscreen, which can recognize up to five touch points simultaneously. The touchscreen works quickly and precisely. We could not find a flaw, even at the borders. The navigation through the touch-optimized user interface is easy and fun. The buttons and tabs are quite small on the desktop, which means that people with thick fingers could have trouble. 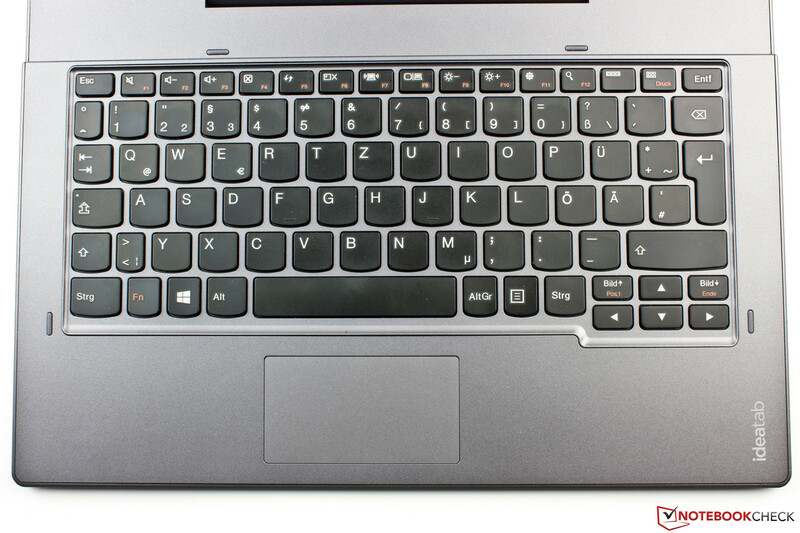 The virtual keyboards in Windows 8 are quite extensive. 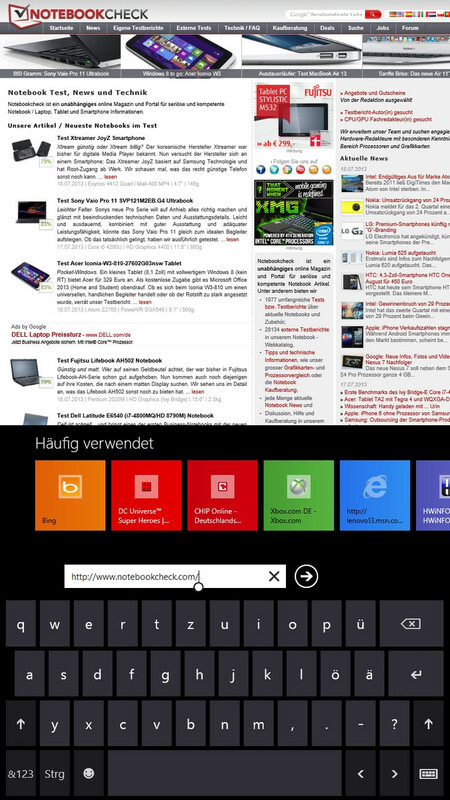 Users who want to use the tablet with both hands will be happy with the split keyboard. Both versions of the virtual keyboard offer plenty of space to work with on the tablet. In portrait mode, the keys are still large enough. The physical keyboard in the dock offers 84 keys cramped in a small space. Especially the Enter, Backspace and left Shift keys should have been larger. 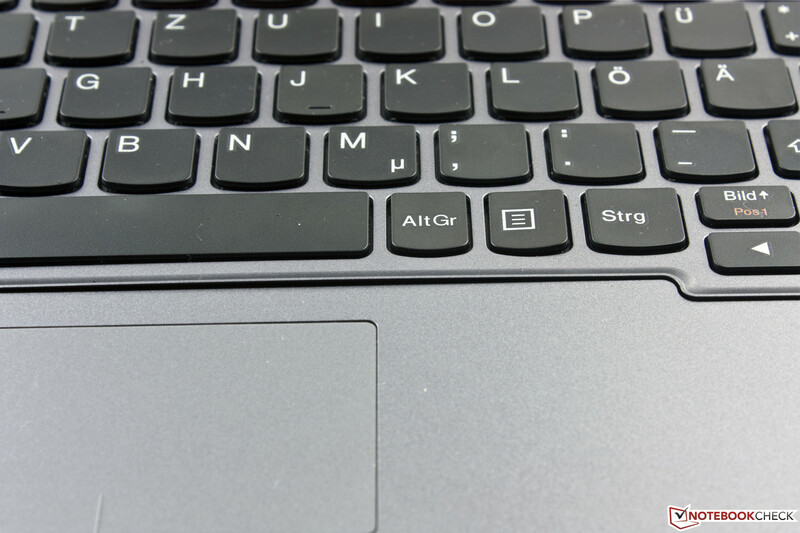 The QWERTZ keys measure 15 x 15 mm and are placed 3 mm from one another. All keys are flat, the stroke distance is a little too soft and the click noise is very quiet. We would have liked to have more feedback from the keyboard. The keyboard base clearly pressed inwards every time we press a key and there is no keyboard backlight. The entire top row is filled with Windows function keys. To use these, press the Fn key and the desired function key. Overall, the keyboard seems quite rickety and will not be fun for typists to use. However, it suffices for an Email or short texts. 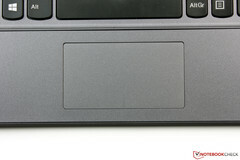 The touchpad has the dimensions: 80 x 46 mm (~3.1 x 1.8 inches). It has two mouse keys on the bottom. These provide weak acoustical feedback and have differing pressure points. The left key requires more force to press than the right one. 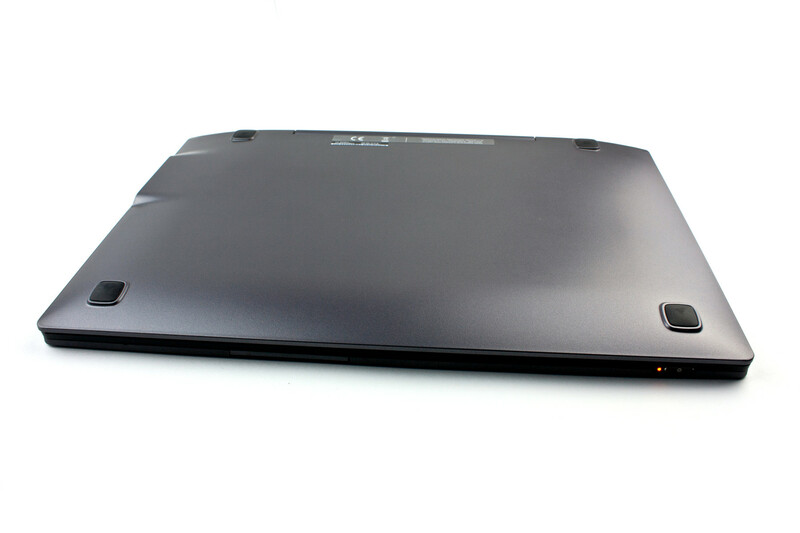 The case surface is easy to slide the finger over, but the touchpad is different. Moving the mouse cursor is often a slow endeavor and multi-touch gestures are not supported. The touchpad is, like the keyboard, not fun to use. The user will quickly change back to using the touchscreen. We recommend using an external mouse when working on the desktop. The keyboard has 84 keys. 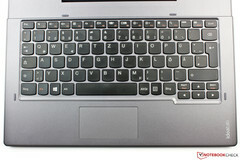 The touchpad measures 80 x 46 mm. 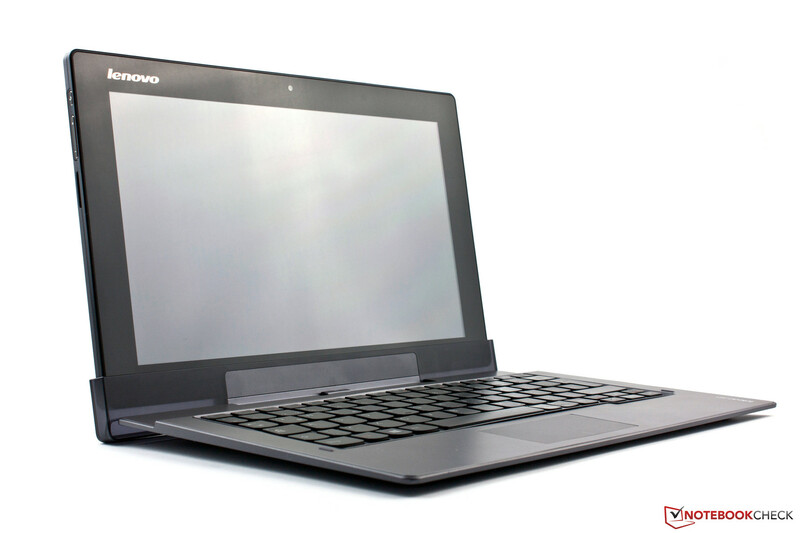 The Lenovo Lynx has an 11.6-inch IPS display, with a resolution of 1,366x768 pixels. 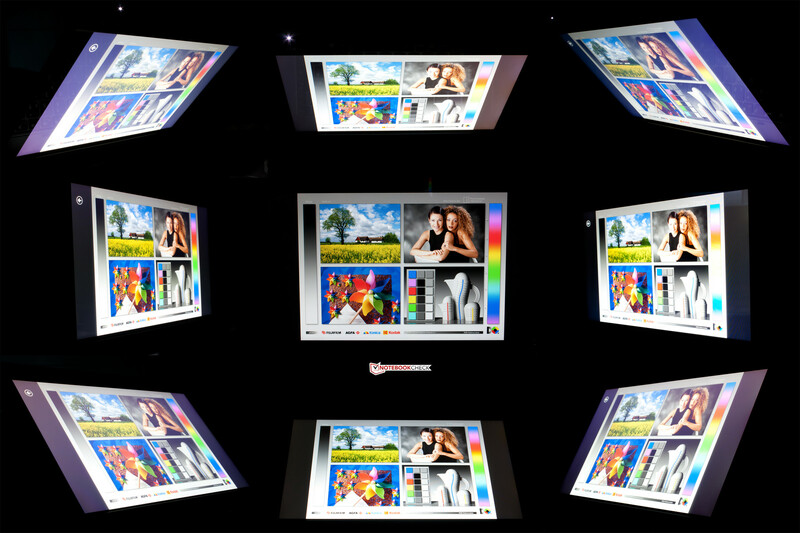 The display format is 16:9 and it offers a pixel density of 135 PPI. Unfortunately, it is not possible to calibrate the device, which means that we could not perform a color spectrum comparison. We could have taken the values from our previous in-depth tablet review in April but the actual values could have significantly differed, as the current brightness is very different from the previous one. The April test model had a maximum brightness of 367 cd/m². The panel we have in our test model offers 423 cd/m² - much brighter. However, the illumination (66%) of our current Lynx is not as balanced. This is probably due to the fact that the brightness drops to 280 cd/m² near the middle left of the panel. Still the Lynx is quite bright at an average of 388 cd/m². The HP Envy (312 cd/m², 88%), the Samsung Ativ (348 cd/m², 87%) and the Acer W510 (277 cd/m², 92%) are more balanced in their illumination but none of them can reach the brightness levels of the Lynx. Sadly, while the screen is black, the user will be able to see multiple anomalies that are called "Screen Bleeding". These may not appear while the display has colorful content, but they will be noticeable in the darker scenes. The black value of the IPS screen is 0.44 cd/m² - not bad. Competitors from HP (0.33 cd/m²) and Acer (0.35 cd/m²) offer slightly better values. The contrast ratio is about 923:1 - high. The color accuracy of the panel is very good. Only the blue tones suffer visibly from color deviation. This positive impression is supported by the DeltaE value of 3.7. The overall positive impression is reinforced by the gray levels, which are slightly better (average of DeltaE 3.2) and have no anomalies. The color saturation is poor in blue (DeltaE 22) and magenta is unnoticeable at DeltaE 10. The Lynx outdoors with direct sunlight. The test model is well suited for outdoor use despite its glossy panel. Reading the display is hard in direct sunlight but in bright surroundings or in the shadows, the convertible is quite comfortable to use. Thanks to the high brightness and good contrast, reflections are not as annoying. The viewing angle stability is decent, but other IPS displays can offer more. Vertically, the viewing angles are fine, but if the horizontal viewing angles change, the colors of the content deviate and a veil covers the panel. Thankfully, this effect is only noticeable in dark surroundings, and in daylight, the user will not notice it. The tablet continues to offer its maximum brightness even on battery. The system hardware comes as no surprise: like most tablets and convertibles based on Intel Atom, the test model uses the Z2760 CPU from the Clovertrail generation. This SoC is unique due to its low TDP of 1.7 Watts, which allows for passive cooling of the system. In addition, the SoC offers PowerVR SGX 545 as the graphics chip and it is accompanied by two GB LPDDR2 (800 MHz) and 64 GB of eMMC flash storage. 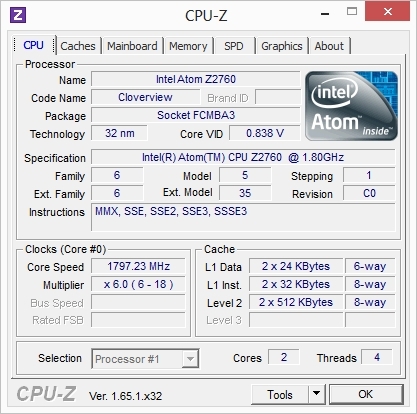 The Atom Z2760 is a dual-core CPU, which can work on up to four threads simultaneously. It is manufactured in the 32 nm format and offers a low TDP of 1.7 W, which is similar to that of modern ARM CPUs. 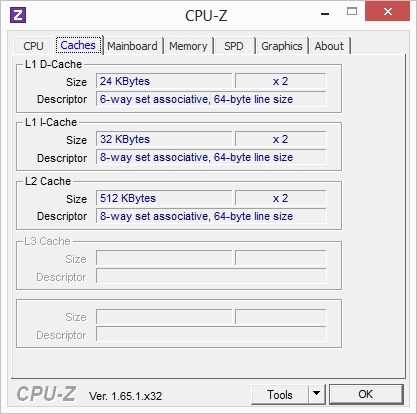 The Z2760 clocks at 1.8 GHz and lacks a Turbo mode. The memory controller supports dual-channel mode and two GB LPDDR2 RAM, which runs at 800 MHz. 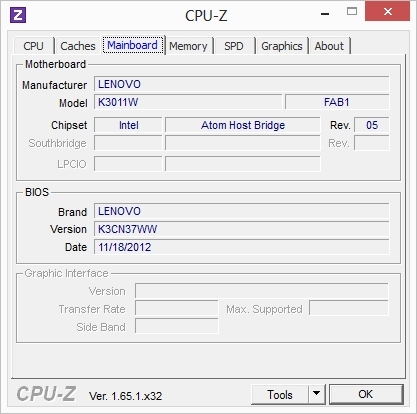 Theoretically the Z2760 can use 64-bit commands as well, but Intel only allows 32-bit. 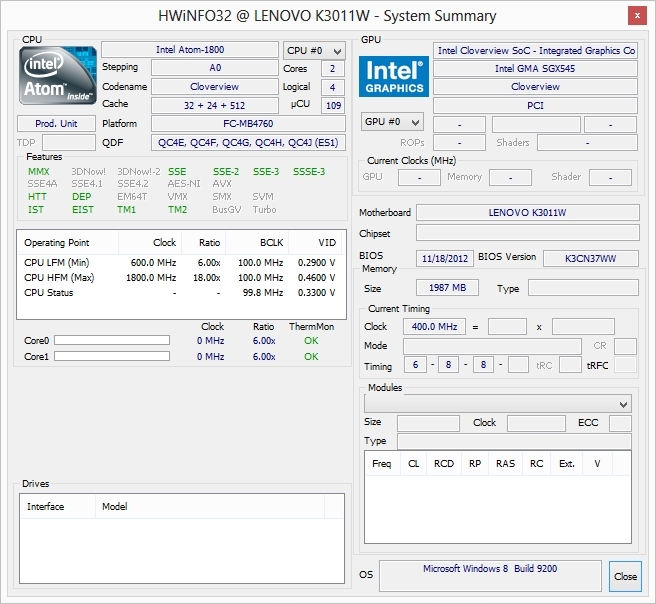 In the Cinebench R10 benchmark, the IdeaTab Lynx scores 1,699 points in the Multi-Core test. This may not be an amazing result, but it lies in the expected region for an Atom processor. In comparison, Samsung (1,700 points), Acer (1,685 points) and HP (1,644 points) offer similarly weak results. The full performance is also available on battery. In comparison to the CPU performance of the ARM competition, the Z2760 places near the Tegra 3. The PCMark 7 (1,421 points) and PCMark Vantage (2,280 points) show that the system offers decent performance. Thanks to the fast flash storage, the scores are even higher. Although this storage may not be as fast as an SSD, the access times are much shorter than a traditional HDD. PCMark 8 runs but while calculating the final result the program crashes. The system performance left us with mixed feelings. 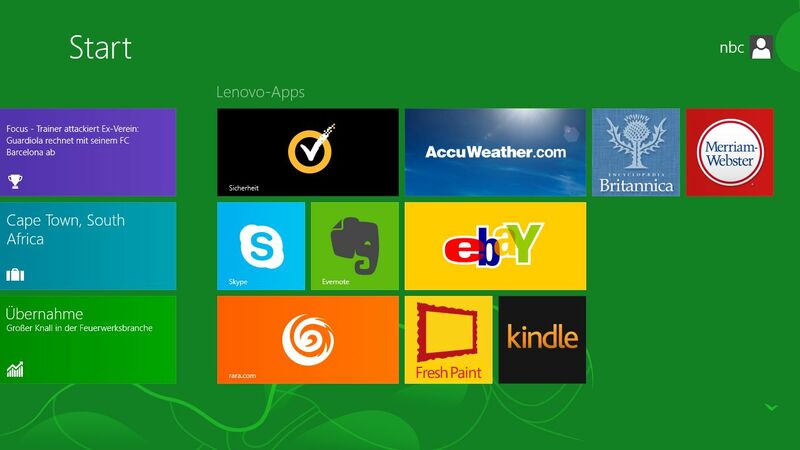 As long as the user sticks to the Modern UI of Windows 8, the system runs fast and smooth. This includes surfing on the web. However, as soon as large programs, like PCMark or an installation, are launched the tablet can undergo long loading times. This becomes especially frustrating when multiple programs are open on the desktop. The Intel Clovertrail platform does not support SATA, which means that using real SSDs is not an option. Thus, Lenovo has chosen eMMC storage. 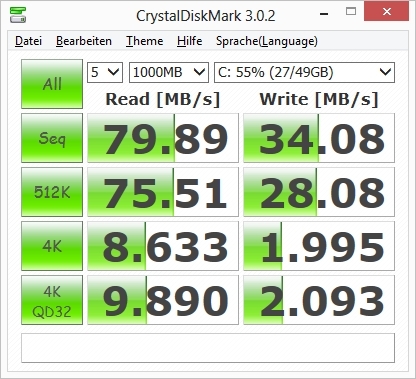 Although they may not perform as fast as SATA SSDs, they are much faster than traditional HDDs. Plus, they are much smaller, have no noise emissions and low power consumption. 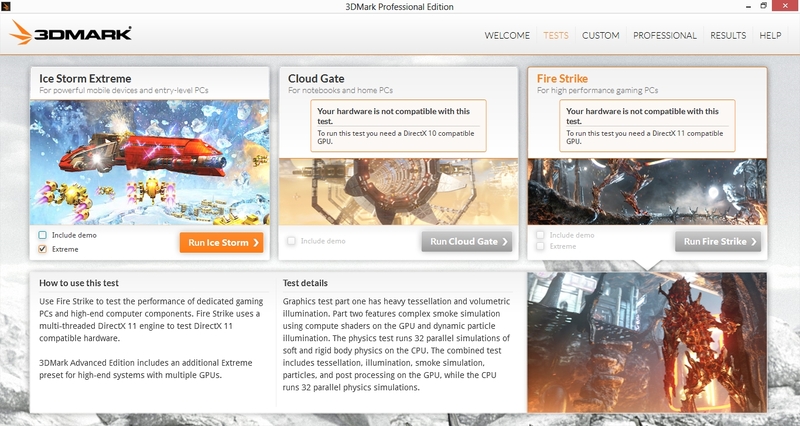 3DMark: DirectX 10 and 11 were not supported. Intel’s Z2760 Atom SoC includes an integrated PowerVR SGX 545 graphics chip, which clocks at 533 MHz and can operate with 64 - 737 MB RAM. The user should not expect great performance. In 3DMark 2006, the GPU scores a poor 455 points. The GPU does not perform much better in the newer 3DMark Ice Storm: 2,450 points. The SoC falls short of the Nvidia Tegra 3, but the real difference in performance is showcased in a comparison to a tablet with an HD 4000 GPU - the SGX 545 is severely outclassed. The full (yet meager) graphics performance is available on battery. 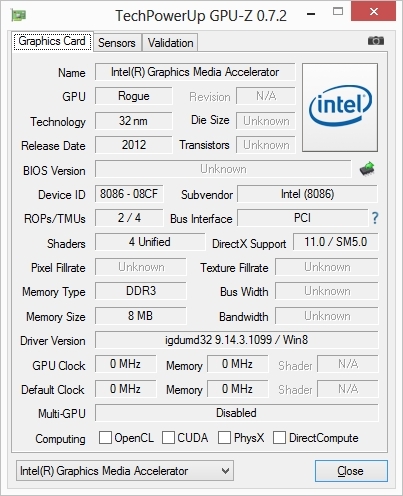 The performance rating of the integrated GPU shows us that the Lenovo IdeaTab is no gaming hulk. The PowerVR SGX 545 supports neither DirectX 10 nor 11, and so the user will have to be happy with older games, and even those can only run like picture slide shows, if they run at all. The latest Company of Heroes 2 only requires DirectX 9 support, which is offered by our test model, but the drivers of the GPU cannot run the game. Small games from the Windows Store, like Cut the Rope, can be run with ease on the K3011W. Classics, like Mahjong and Solitaire, work well too. Company of Heroes 2 does not start despite the DirectX 9 support. The passive cooling of the tablet requires low temperature emissions from the Atom SoC, so as to prevent an overheating of the system. The test model we checked in April (K3011W) mastered all the tasks well and reached a temperature of 40.8 °C (105.44 °F) at load. 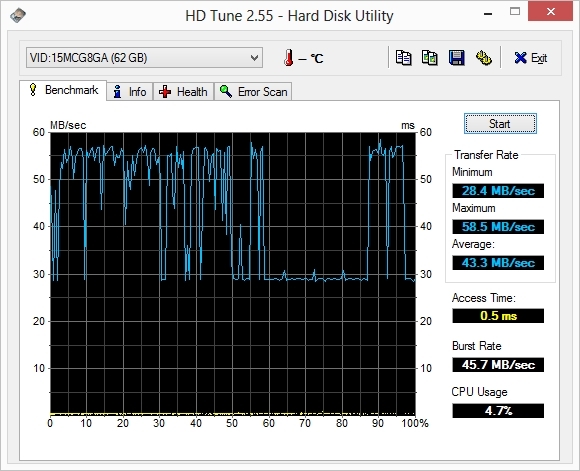 This was measured using a full-load scenario in which we ran FurMark and Prime95 simultaneously. The keyboard dock raises the emissions a little and at full load, the convertible reaches up to 42.6 °C (108.68 °F). The increase is due to the emissions resulting from the charging of the dock battery. As the main battery is charged from the dock battery, it also generates heat. The docking port stays comfortably cool at all times. The temperature differences while idle are much clearer. Without the dock, the Lynx can reach a maximum of 30.4 °C (86.72 °F) while idle, but with it, the emissions rise up to 37.0 °C (98.6 °F). 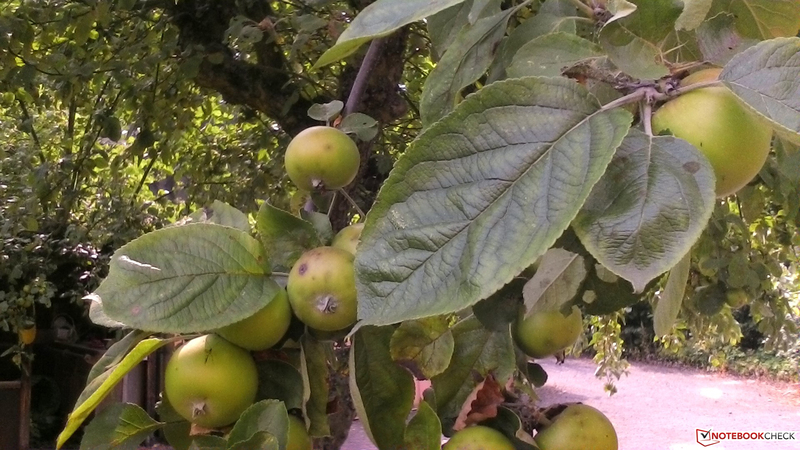 Although this is higher, it does not make much of a difference, as it still lies in a comfortable region. During the stress test, (FurMark and Prime95 run simultaneously), this pattern continues. The CPU is much hotter, when the tablet is docked. At an average of 84 °C (183.2 °F) (-7 °C/~-13 °F without dock) the system runs well and offers maximum performance. Even on battery, there is no loss in performance. The keyboard dock does not heat up too much, as except for the secondary battery, none of the components of the dock heat up much. (+) The average temperature for the upper side under maximal load is 31.9 °C / 89 F, compared to the average of 30.3 °C / 87 F for the devices in the class Convertible. (±) The maximum temperature on the upper side is 41.6 °C / 107 F, compared to the average of 35.4 °C / 96 F, ranging from 21.8 to 55.7 °C for the class Convertible. (+) In idle usage, the average temperature for the upper side is 31.4 °C / 89 F, compared to the device average of 30.3 °C / 87 F.
(+) The palmrests and touchpad are reaching skin temperature as a maximum (32 °C / 89.6 F) and are therefore not hot. (-) The average temperature of the palmrest area of similar devices was 29 °C / 84.2 F (-3 °C / -5.4 F). Two stereo speakers can be found in the IdeaTab Lynx. These are placed on the left and right borders of the tablet. Although the hands of the user might accidentally cover them, the tablet offers enough surface area to hold the device without blocking the sound. The sound is acceptable for a device of this class. It is a little dull and the middles are weak. The high notes are quite good and there is even a little bass. If you want to listen to some music on-the-go or watch a video, the speakers offer sufficient performance. While idle, the convertible requires 1.5 - 5.5 W. This is close to the class best, the Samsung Ativ XE500T1C (1.6 - 4 W). If the IdeaTab is removed from the dock, the consumption drops to 4.3 W.
At medium load, which is simulated by running 3DMark 2006, the consumption rises to 5.9 W. We can simulate maximum power consumption by running both CPU and GPU at full load (Prime95 + FurMark), all wireless modules on and brightness turned to maximum: 8.5 W without the dock. While off, the tablet requires 0.1 W whereas the convertible needs 0.3 W. Similarly, in standby, the tablet requires 0.1 W and the convertible needs 0.2 W.
The 10.4 W power adapter (5.2 V and 2 A) barely covers the maximum power consumption. As such, it takes a while to charge the test model to full capacity. Both batteries together require eight hours to fully charge. Measuring the battery life was quite hard. 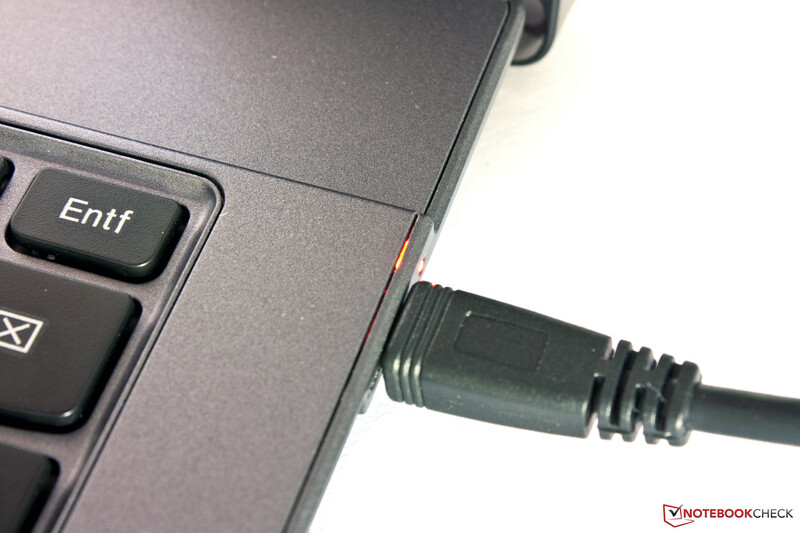 As the keyboard dock is only connected via a Micro USB port to the tablet, Windows recognizes it as a short-term power source. We did not expect any major problems, but as soon as the battery of the dock reaches 4% (critical level), the convertible goes into hibernate mode. This did not happen every time and we could not discern a clear pattern. 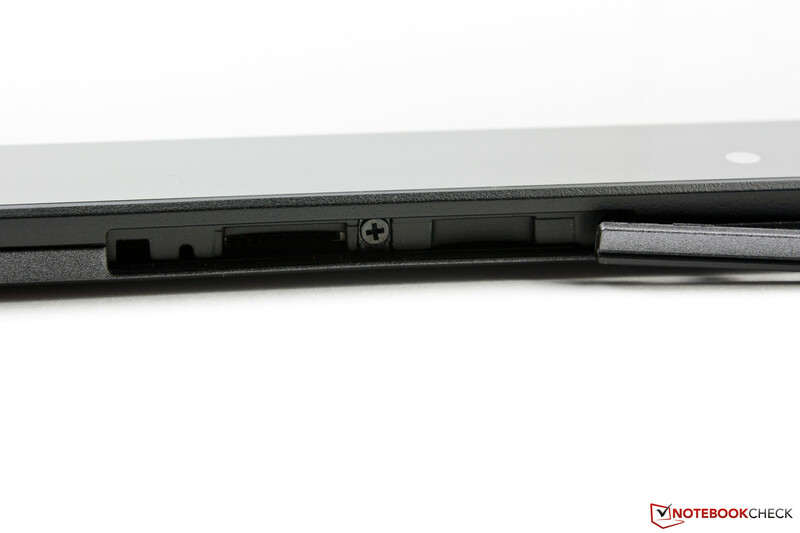 The convertible contains two 25.5 Wh batteries (tablet + dock). This should allow the convertible to run for a decent time. We measured the minimum run time of the K3011W with the dock (K30PK11) using the Classic test from Battery Eater Pro (minimum brightness and wireless modules all turned off). The convertible lasted 7 hours and 47 minutes - quite good. It lasts much longer than the HP Envy x2 (07:07 hours), but it cannot keep up with the Iconia W510 (11:17 hours). 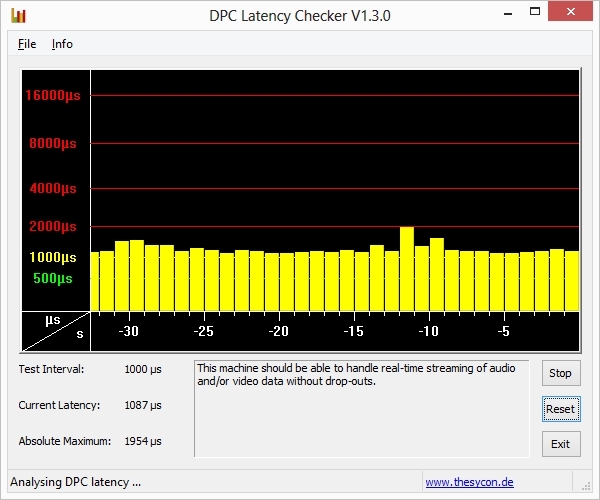 The practical run time was measured using the WLAN test. In this test, we adjusted the brightness to 150 cd/m², turned on the WLAN and ran a script that loads a new webpage every 40 seconds. The batteries were depleted after 12 hours and 30 minutes. This may sound impressive, but the Acer Iconia can trump it by 1 hour. Once again, the Envy cannot last as long as the competition. However, keep in mind, that it uses smaller batteries (2x 21 Wh) than our test model. 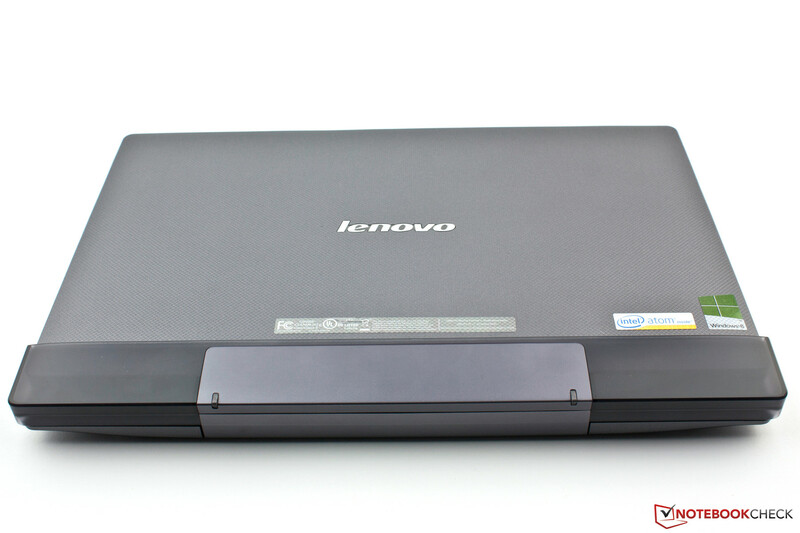 Lenovo claims that with the K3011W docked, the user can reach up to 16 hours of run time while surfing the web. This run time seems very optimistic, given our measurements. 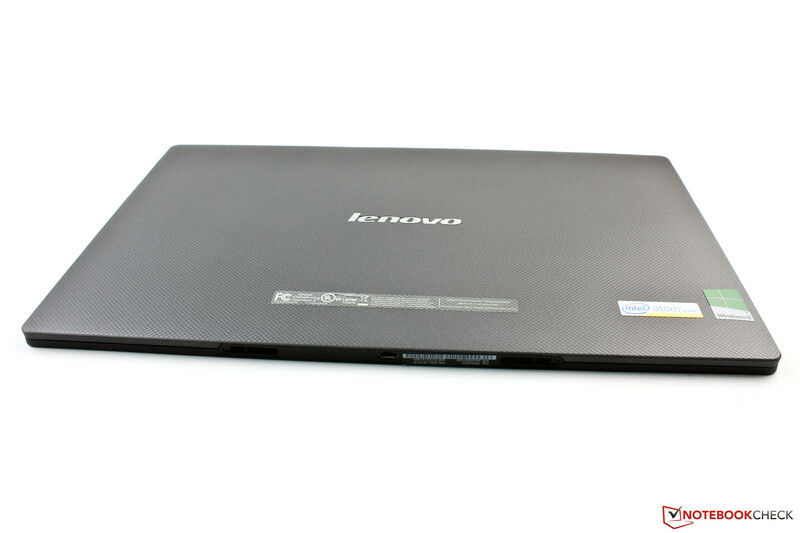 In Review: Lenovo IdeaTab Lynx K3011W including keyboard dock. 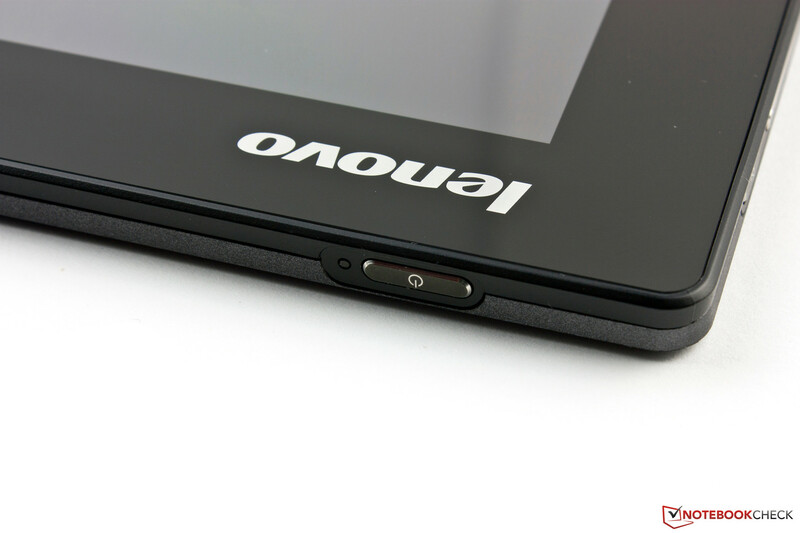 The test model of the Lenovo IdeaTab K3011W we checked in April impressed us. However, the addition of the keyboard dock K30PK11 has lowered our overall rating. The mobile dock may add 2 USB ports and increase the battery life, but that is all it has to offer. The two devices interface with each other via the Micro USB port of the tablet, which means that the two USB ports on the dock have to share the performance available, thus, the docking port turns into a bottleneck. Furthermore, switching between the two batteries does not work as well as we would have liked. Finally, the poor workmanship of the K30PK11 and the modest keyboard and touchpad all offer plenty of room for improvement. The poor keyboard dock has done more damage than good to the overall rating of our test model. Still, the tablet itself is quite good and for more details about it, take a look at its solo review. Sadly, Lenovo did not manage to improve on the great tablet they introduced in April of this year. In our opinion, the performance offered by the keyboard dock is not worth the additional investment of 149 Euros (~$197). The competition, such as Acer, Hewlett Packard and Samsung, have more to offer for the same money. If the App offering of Windows Store fulfills your needs, you might be also interested in the Windows RT convertibles, like the Dell XPS 10 or the Microsoft Surface RT. Their prices have dropped significantly. In addition, they offer good performance and come with Microsoft Office Home & Student RT. A free update to Windows RT 8.1 will add a full-fledged Outlook App to the convertibles. Our test model is delivered in two boxes. 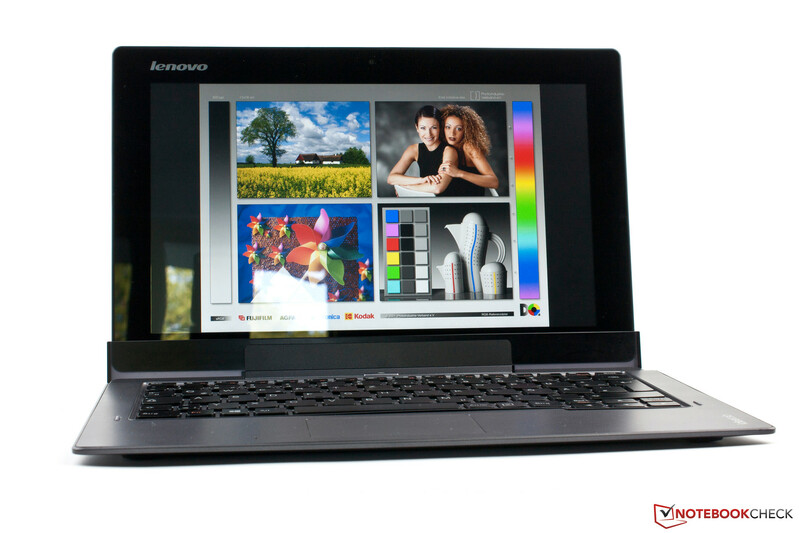 The Lenovo IdeaTab Lynx K3011W uses an Intel Atom platform. The IPS panel promises great viewing angles. The resolution is 1,366 x 768 pixels. Max opening angle: around 135°. Four rubber feet on the bottom secure the model. Two USB 2.0 interfaces and a Micro USB port. 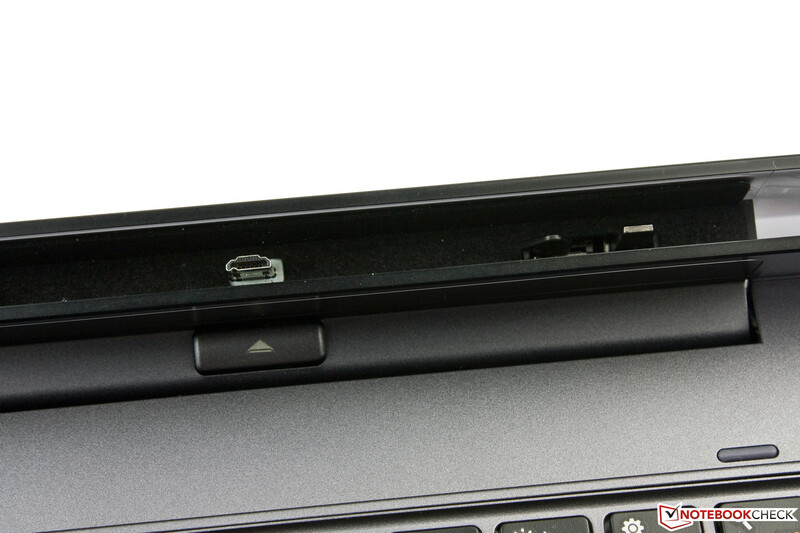 The Micro USB port serves as the interface for the keyboard dock. The back of the tablet. The "Power" button is on the case edge. The card reader is hidden behind a flap. The open MicroSD card slot. Speakers, Micro HDMI and combined audio jack. Volume rocker and rotation lock. The webcam has a resolution of 2.1 MP. The webcam is well-suited for VoIP. The power adapter offers a mere 10.4 W.
A few Apps are preinstalled. The display is bright enough to work outdoors. The mobile dock is not great. The workmanship is poor and the keys often need to be pressed down hard, before they recognize the input. The entire base seems rickety. 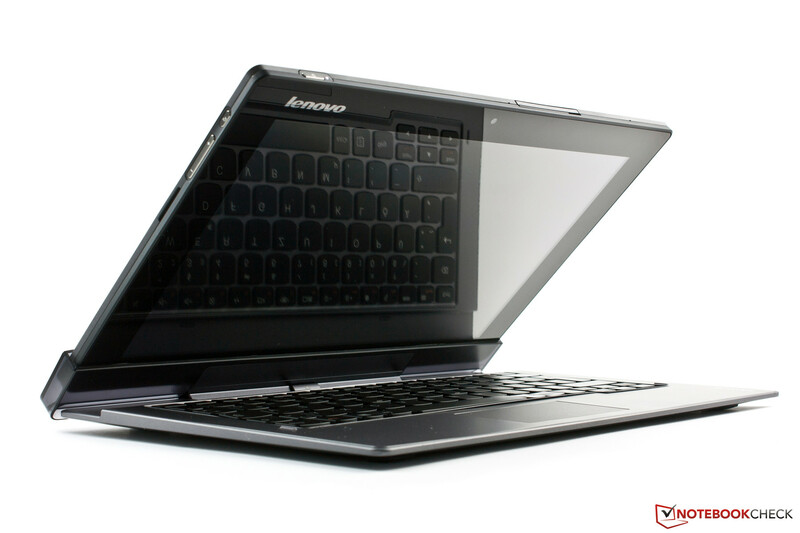 Lenovo constructed a good tablet, but somehow failed to make an appropriate keyboard dock. The competitors include Acer Iconia W510, Samsung Ativ Smart PC XE500T1C, HP Envy x2 11-g000eg, Dell XPS 10, Microsoft Surface RT and Asus Transformer Pad Infinity TF700T.